BULAWAYO (IPS)— When Lawrence Afere told his parents he was going into farming rather than getting a job in Nigeria’s lucrative oil and gas sector, they swore he was bewitched. “After saving to put me through the top university in Nigeria with an eye for a job in oil and gas, my parents had no explanation for my career choice. They were convinced I had been bewitched,” says the 35-yearold Afere who started a group that brings together unemployed youth to grow, sell and add value to agricultural produce in Nigeria. Given the entrenched beliefs across Africa about sorcery, the idea that Mr. Afere was bewitched seemed a plausible one to his parents. In fact, Mr. Afere’s parents had it on the advice of a traditional herbalist that he was going to be rich. But his parents didn’t believe that he could ever become wealthy through agriculture. Nigeria, a net food importer, has the double challenge of providing enough food and jobs for its bulging population, especially the youth. It spends $22 billion in food imports, almost 60 percent of Africa’s $35 billion annual food import bill, according to the African Development Bank. The country is Africa’s largest producer and consumer of rice. However, it is also one of the largest importers of the cereal in the world buying about two million ton annually to offset local consumption of five million tons against a production of three million tons. The West African nation also has over 80 million hectares (197.7 acres) of good fertile soil to grow any kind of crop. Mr. Afere had a solution: get the youth to start farming and to make agriculture a profitable and appetizing career prospect for young people aged 15-24. This demographic makes up about 26 percent of 20.9 million unemployed Nigerians. “I read an article that every year in Nigeria we will graduate one million young people with a high school qualification but with no prospects to go to a university,” said Mr. Afere. “This is one million highly frustrated youth and by 2030 Nigeria will have over 30 million highly skilled—not doctors, not lawyers,farmers or entrepreneurs—but skilled criminals that could devour the entire country. At that moment I had a mindset shift.” So, he founded Springboard, a social enterprise growing organic produce through a social media network of farmers. It also aims to create jobs for women and youth in Nigeria. Springboard uses social media to raise awareness about opportunities in agriculture. It has over 5,000 followers on its Facebook page, which it uses to create a market and to supply produce to vendors and customers. This is how it brings together farmers and consumers. “We also use it to provide continuous mentoring and extension services to our farmers, youth farmers especially,” Mr. Afere told IPS. The social enterprise is currently developing a farmer’s helpline that will give farmers access to agricultural information via a toll-free number in four of Nigeria’s major languages. Springboard has sought to stop young people emigrating from rural areas to urban centers in search of jobs, which are hard to get, Mr. Afere said. “We know young people want to be successful and rich, the idea is how do we help them to be successful by identifying livelihood opportunities in the agriculture sector where they live,” said Mr. Afere. Through the social enterprise, youth and women work across the agriculture value chain in production, processing, value addition, storage, distribution and marketing. They are trained in agriculture production and management and given inputs to kick start their own farming enterprises. Recently, the social enterprise started a Farm to School program, which is supported by the Mitsubishi Foundation for Africa and Europe. 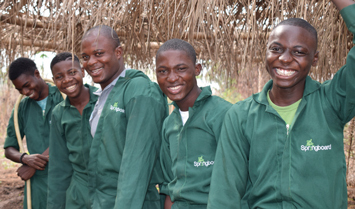 Through the program, Springboard partners with schools to establish school farms where students learn to grow their own food within their communities, thereby raising their interest agriculture. So has he become wealthy? As his parents had pictured? While Mr. Afere has combined the lure of technology and the economic prospects in agriculture, training and mentorship are important in fostering the adoption of farming as a business by young people. One Nigerian technology hub is helping groom and support entrepreneurs tackle development challenges across Africa, but specifically in Nigeria. “That agriculture, which employs most of our parents, does not provide [enough] money is something that worries a lot of young entrepreneurs,” says Wole Odetayo, executive director of Wennovation Hub. Wennovation Hub is a pioneer technology accelerator and incubation program that helps start-ups develop and validate their ideas and innovations using basic business tools in the social impact sectors in agriculture, healthcare, clean energy and social infrastructure. “We are leveraging on their interests, ideas and background of young people to help them think through the process of making the most out of agriculture through technology to solve different challenges across the agriculture value chain,” Mr. Odetayo told IPS. He urged governments to support incubators and accelerators by including start up and small business in the procurement policies. To date, Wennovation Hub has supported over 300 startup teams and more than 6,000 youths running startups valued up to $2.5 million through its network across Nigeria. The digitalization of agriculture offers young entrepreneurs the opportunity to create disruptive business models that accelerate modernization of the sector, says Michael Hailu, Director of the Technical Centre for Agricultural and Rural Cooperation (CTA) a joint international institution of the African, Caribbean and Pacific (ACP) Group of States and the European Union based in the Netherlands. “Achieving this kind of transformation requires that young people engage in agriculture; we need their capacity for innovation, for doing things differently, for harnessing the exciting developments we are seeing within and outside the realms of agribusiness,” Mr. Hailu told IPS.